Possibly the biggest discrimination issue we face today is not really race, but income separation. Even the neighborhoods that people live in tend to discriminate based on income and housing type. There's single family residential, which really should be called "single family ONLY residential." Entry into some of these neighborhoods now requires qualifying for a million dollar mortgage. Then there's the idea of mixed use and mixed income zoning. An innovation that I think could do more to knit this segregated country back together better than all the rallies, speeches and "remember Martin Luther King" specials on the media. Yes it's good to remember Martin Luther King, but what are people doing now? Maybe this isn't the greatest example, but it's enough to impress me. 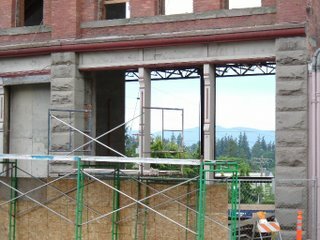 Last weekend there was a feature in Bellingham Herald about the Waldron Hotel, now converted to condominiums. Yes, they're pretty expensive, like in the $900,000 to million range, but the slide show that went along with that article intrigued me. 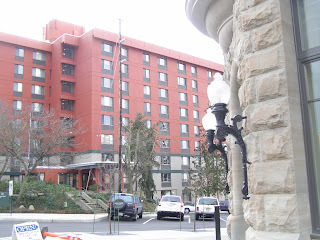 In the background of many Waldron fixtures was the red facade of Chuckanut Square; a low income housing project. Yes, basically right across the street (or really across a parking lot) are the Waldron and Chuckanut Square. It's a mixed income Neighborhood. Chuckanut Square. lamps at south end of Waldron in foreground. I biked down to Fairhaven to take my own picture of that interesting mix. Also stepped inside one of the Waldron's units that was having an open house. No, I couldn't afford to buy, but it was interesting to step inside just so I could say I'd been inside the Waldron. Actually, I kind of got bored in there. Yes, it's a fancy unit, but I've never paid that much attention to furnishings, fancy bedspreads, wine bottles and counter tops. It was interesting, for about 5 minutes. I have friends who would have stayed much longer. They often discuss differing counter tops and sofa spreads while my eyes gloss over during our Wednesday Gay Men's Dinner Gathering. Different interests for different folks. Are they wealthy, or just wealthy wannabes? Or maybe they work in the field of interior decorating? So it takes quite a bit of money to restore such an old building as the Waldron. Until now, it never really recovered from the panic of 1892. Top floor was never finished and sat empty all those years till this recent renovation. It's nice to see that building with a new lease on life. Most of the interesting features are external, in my opinion. Basically the inside was totally redone, to modern earthquake codes and so forth. The old facade remains with a new lease on life and right down the street there's lower income housing. Within easy walking distance is shopping and some cultural life. I've been to several planning discussions where the virtues of mixed income and mixed use zoning are discussed. A way to reduce some of the growing separation between the Haves and the Have-Nots. Earlier pictures during reconstruction of Waldron. 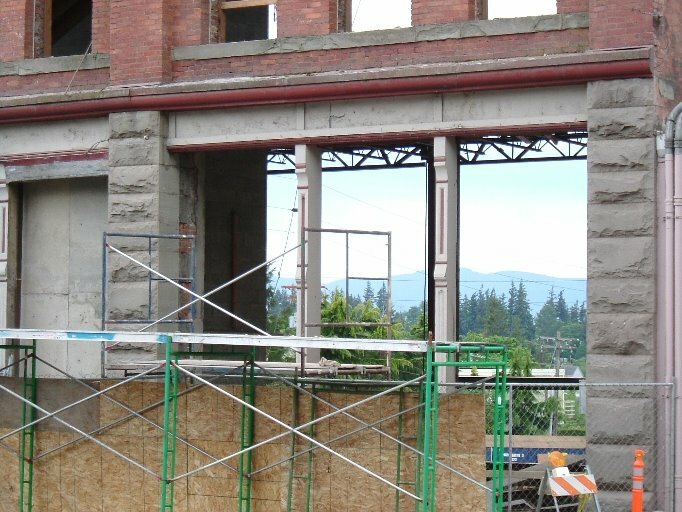 As they restore old Waldren Building in Bellingham's Fairhaven District, scenery is visible through the building. Old insides have been gutted as the facade is being preserved. 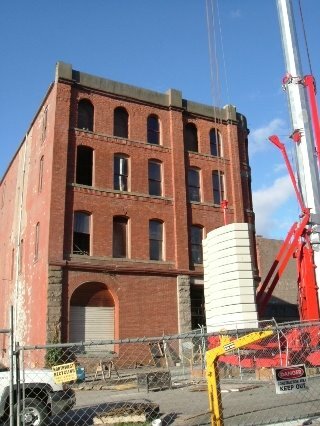 Building was started, I think around 1890, but never totally recovered from economic panic of 1893. Top floor never finished. Now, 2006, restoration is starting. it is being turned into condominiums and finally finished to the top.